Compilation VIDEO: Texas Combat Team Tactics / Mobility Class. My goal in writing this – to motivate the reader to get more training. Get to West Virginia to a MVT class. Take a square range pistol or carbine course in the interim. 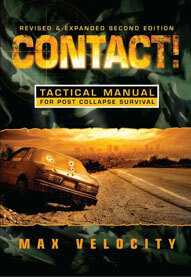 Read Contact, the Reluctant Partisan, Sparks31 comms book, John Hurth’s tracking book, etc. Get motivated, and realize that you probably dont know how to fight. Get motivated, and KNOW that you need PT, and that you need to be getting stronger and more fit every day. Overview: This was a class where MVT traveled down to Texas to train responsible armed citizens in how to run their rifles, fight as team, and then how to fight in and around vehicles. The purpose fits the average guy pretty well – you will likely want to drive somewhere in your car. Learn how to not die with MVT. People: 16 students of varying backgrounds. A few with prior military experience (Thanks to the Marine for being willing to share his story). A few ‘training junkies’ who have taken thousands of hours of training. A few guys with zero prior experience in training. Max taught the class by himself. The hosts were wonderful and have a very nice setup. About myself and previous training: I have attended several “Square Range” type courses from various folks, including pistol, carbine, competitive shooting, combatives, etc. I never served in the military or Law Enforcement. My most relavent prior training was the last year – i had the opportunity to attend John Mosby’s (mountainguerrilla.readfomag.com) Small unit Patrolling class. At that course, held near Prescott, Arizona, Mosby covered weapon manipulation, patrolling formations, battle drills, principles of patrolling, etc. It was an awesome class and i learned a bunch about a lot of topics. Since that time i have practiced what i learned, and thankfully was able to expand on my skillset with this MVT class in Brady. Location: the ranch was a perfect spot of Texas hilly country, with everything from oak trees, bluffs, hills, creeks, long roads, goat pastures, and ponds. This gave Max the chance to really take advantage of the property and develop quality ranges specific to the drills. A majority went to town together as a group. 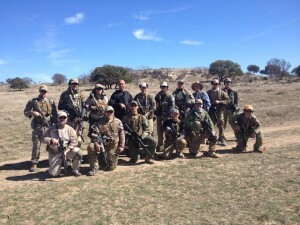 This course: covered shooting, weapon manipulations, malfunction clearing, react to contact, individual movement techniques, buddy team bounding, four man battle drills – advancing forward breaking contact, peeling left or right, rallying up. Patrolling formations – modified diamond “Column”. It then covered fighting in vehicles, ideas about vehicle convoys, tactics for spacing, bounds, security halts. Max covered a lot of topics covered in Contact during a lecture portion. This was vital – and better than just reading the book because you could ask him questions and further develop specific topics. The most fun drills were involving vehicle down, reversing out, quick reaction force, all vehicles down, etc. Basically – get the people out, fight if you need to, get out of there. An awesome drill was the squad attack, with one element providing suppressive fire, and the other maneuver element flanking and attacking. lots of fun. – Peeling left and right as a team when under contact from the side, and situational limitations don-t allow you to break contact like you normally would. – All of the vehicle stuff – my only previous knowledge was… hollywood crap. Now i have a decent idea of what to do, and how to practice it. I will be training my friends and family. – I will not be following through with my previous plan of purchasing a travel trailer to carry “bug out stuff”. I will instead plan on having multiple vehicles and drivers in a convoy. –make yourself available to help others who need it: mindset, skills, techniques, and of course gear. Some guys at these courses will be pretty fresh with their rifles, gear, and will need some encouragement. – My dang rigid cleaning rod that i had taped onto my rifle came off during one of the drills somewhere on the ranch. Previously i had it taped up so secure that i was not able to get it out under stress without accessing a knife to cut away lots of tape. So i loosened it. Apparently too much. woops. – I screamed my head off the first few days trying to be loud enough for my battle buddy to hear. Then i didnt have a voice for the last three days. Woops. Lesson learned – dont scream quite as loud? practice screaming? Learn how to yell without screwing up my vocal cords? – The Big Stuff – Having been to John Mosby’s Small Unit Patrolling class last year, i had a good idea of what i was getting into as far as individual movement techniques, battle drills, principles of patrolling, and “fighting with a team” go. (obviously in a training environment, not in real combat). This allowed me to be helping others more, refining my skills, focusing on ‘headshots only’ if possible, instead of sucking wind and scared. Mosby’s class and this MVT class had different end-goals in mind, and are hard to compare. I learned an incredible amount of information from both of them and highly recommend both trainers. – the little stuff- have your gear ready before class. Pack smart so you can get to things easily. Move your ammo out of the little boxes into a big tool bag or ammo can for easier reloading. Tape up your mags with bright orange or yellow (or MERIKA) tape to make them easier to see. – PT – i have been training PT as hard as i can, 4-7 days a week, since i started reading Mosby’s blog and got motivated. It helped me in his class to not have to sit out any drills, and another year of PT made this most recent MVT class in Texas much much easier. It wasnt ‘easy’. I was exerting near maximal effort on the bounds and drills. The difference? I didnt get tired, sore, and i recovered extremely quickly. This class was an ‘off week’ for me PT-wise. Get you some crossfit, MovNat, burpees, heavy sandbag lunges, squats, push press, etc. Build the habit of doing more stretching/mobility work (youtube Kelly Starrett and Vic Verdier), more squatting/hip hinging and extension, and more MOVING. Lookup ido portal and crawl around. Look up MovNat and do what they do. Sign up for MVT tactical PT program. Join a crossfit gym. Take brazilian jiu jitsu classes. Take a daily walk with or without your ruck. Eat healthy ( i prefer paleo/primal). CONCLUSION: Get training. Do more PT. Practice your skills. Teach others. Build your tribe. Repeat. Most excellent AAR, and good recommendations on the PT stuff as well. To be truly dangerous to your enemies, train at MVT.